The Samsung Galaxy Tab 7.0 Plus allows you to password protect your tablet like most phones and tablets these days. This is nice and gives you a bit of security if you leave your Tablet lying around. I like that you can even put a fun message on the Lock Screen! If you do decide to put a message on your Lock Screen, you'll have to remember that it might be hard to see as the text is grey and with some different Wallpapers it might be hard to see. The Samsung Galaxy Tab doesn't have a slider in the notification tray that pulls down to show the notifications like the Nexus S does. App notifications pop up on the task bar and emails notifications will pop up in the corner. 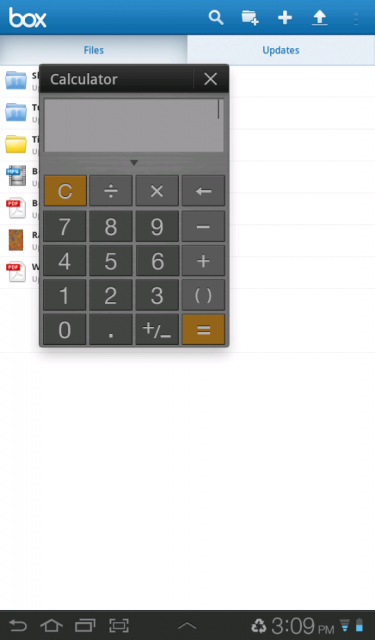 The task bar does pull up just enough to view some quick apps like music, calculator, calendar, pen memo, task manager and world clock. It's interesting though that this also acts as a quick-launch bar and you can pull up any of those apps whenever if the task bar is available. As I had mentioned before, I love that you can take screenshots by pressing the broken square/rectangle icon on the task bar. When you do so, the screen will brighten. One very interesting widget the tablet has is a spot for your buddies that you email and contact you the most. It makes it quick and easy to access their information so you don't have to search through your big list of contacts. Also with that you can have website widgets for websites you like to go to most often. When you are using the tablet, the battery goes into a battery saving mode when it drops to 50%. It will make adjustments as to how long the screen will stay on (it will most likely go off after 30-60 seconds) as well as adjust screen brightness. Even though it doesn't have a big notification bar like a Gingerbread or ICS Nexus S phone has, it does have sounds and pop ups for notifications. In terms of audio quality, the speakers sound great and are clear without a lot of distortion - at least at moderate volume levels. Along the bottom of the screen is a button that looks like a double rectangle/square. When I hit that button, my first thought was that it was a fast way to close your apps like on ICS. Instead it's a faster way to get to your open your active programs like you would on a computer. The dual-core processor can keep a lot of programs running in the background and this is a quick way to get to those programs. What's a tablet without apps? When you download an app or widget from the Google Play store you simply just tap the plus sign at the top right corner to add a widget or app to your screen - or press and hold the screen. 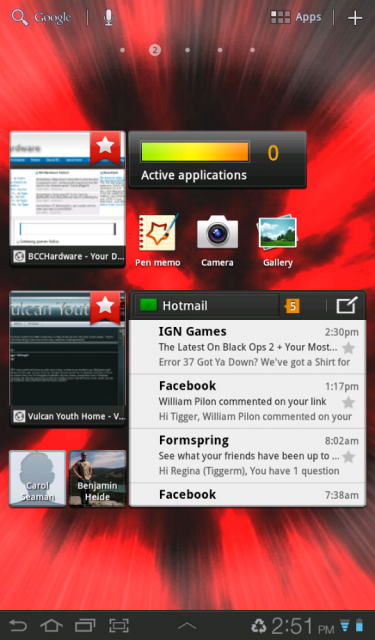 One thing I like is when you are in your app library, the Galaxy Tab 7.0 Plus will also display the home screens of the tablet once you select the app or widget you want. This way you are able to quickly select one of the home screens to drop it onto. That's a nice feature and it saves you from dragging it across the tablet to the screen to where you want it. It's also pretty cool that you can go to the app store while in your app library! There are so many things that Samsung Galaxy tablet has to offer and try out that the list is endless! On the last page we'll wrap up all of our thoughts with a conclusion.